The Google Map Location asset allows you to plot locations on the Google Map with a set of latitude and longitude coordinates. Map locations allow you to show users specific points on the map such as a business, landmark or city. Once created, you can configure the settings of your Google Map Location on its associated asset screens. These screens are often the same or similar to those for a Standard Page and are described in the Asset Screens manual. In this chapter, we will describe the Details screen, which is different for a Google Map Location. The Details screen of a Google Map Location allows you to enter information about the location including its latitude and longitude and description. 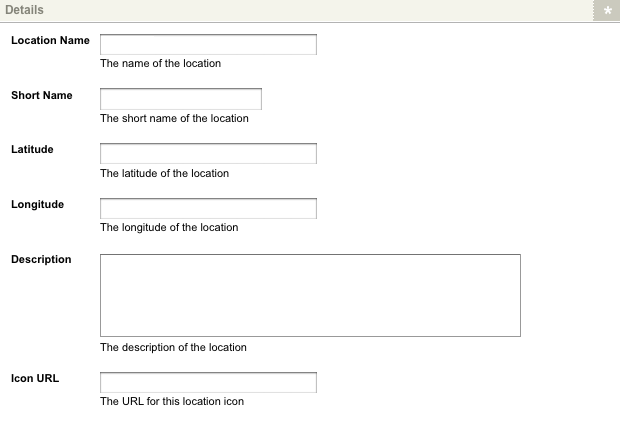 This section allows you to change the location settings for the Google Map Location. the default icon for a location on the Google Map.